A chain saw large enough to cut down a palm tree requires quite an investment. Even a rental fee can be too much of an investment, especially if you are uncomfortable using power tools. You don't need a chainsaw to fell a palm tree. A manual saw is just as effective at cutting down these narrow-trunked trees. The tools and the job, however, are equally as dangerous. Follow all safety precautions and hire a professional if you are unsure if you can complete the task safely. 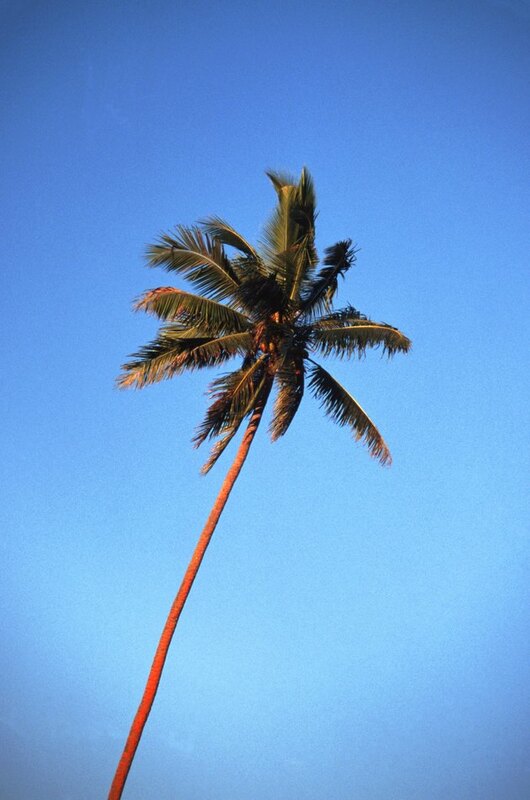 If you're palm tree is leaning, it will likely fall in that direction. Determine the direction in which you would like your palm tree to fall. The planned direction must be clear of any obstructions or hazards, including buildings, desirable plants or high-traffic areas. If the palm tree is leaning in one direction, that is the direction in which it is most likely to fall. Saw a horizontal cut one-third of the way through the trunk of the palm tree on the side of the trunk facing the direction you want it to fall. Make a diagonal cut below the cut. Start the cut roughly 3 inches below the first cut. Saw upward to meet the base of the first cut and remove a wedge of the palm tree trunk with a 30-degree angle. Clear the area. Warn everyone on the property to stand well out of the way. No one should stand on the fall side of the tree. Also prevent anyone standing on the direct opposite of the fall side. There is a small chance that the tree will "kick back" and fall back onto the felling cut. Anyone standing near the tree when the felling cut is made must stand to the left or right of the planned fall direction, as far away from the tree as possible. Saw the horizontal felling cut. Start the cut on the opposite side of the notch of the tree, 1 inch above the hinge of the notch. Cut through the trunk until it begins to fall toward the notch. Back away from the tree quickly and announce that the tree is falling. Stay to the left or right of the direction in which the tree is falling.